One of the most difficult areas for new businesses is how to build their list of viable prospects. For many entrepreneurs list building is painful. Let’s just call it what it is – prospecting, and nearly every sales person will tell you they hate prospecting. But it is the most important part of your business. Without a list of potential clients you have no business. Just as in the offline sales cycle, you must make time to market or prospect each and every day if you are to truly scale your business. In this post we’ll explore a way to build your list of prospects quickly with website tweaks. Just how do you do that? There are several ways, many of which have been addressed in previous blogs. Basically you want to consistently share helpful information based on your expertise. But, how do you get website visitors to actually take the step of opting in to your list? You must make it easy to do so and have a compelling offer. Simply asking someone to sign up for your newsletter is not going to cut it. Most people spend less than a minute on a website. Yep, you read that correctly – less than a minute. So you had better pique their interest or provide a solution to whatever they are searching for quickly. People leave sites when they can’t find what they are searching for. If your site is able to keep visitors past the minute mark than the next step is to make it easy for them to join your list. Take a good look at your site, have you made it easy for visitors to join your list? Simplicity is key, even if someone is interested in hearing more from you, they are not going to spend time searching for a way to opt in. 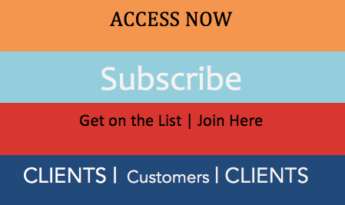 Ideally you’ll want five opportunities for people to subscribe to your list. A form or a link to a landing page (where visitors must enter their information in order to access info.) on every page of your website? A form or a link to a landing page in every blog post? A pop up with an offer or a helpful download that automatically shows up on blog posts? A compelling offer in your sites header and/or sidebar? A pop up form that is activated just before someone leaves your site? Most people wrapped up in the design of their site that they forget about its functionality. You’re site should be working as an extension of you. Take the time to put the proper pieces in place an you’ll have a much easier time growing your business. Want more ideas on building your list, gaining greater visibility and reaching more of your ideal clients, Register for the upcoming webinar and start growing your business.